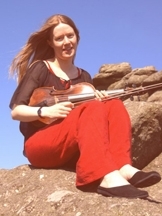 During the final year of her postgraduate studies at Birmingham Conservatoire, Kate Fawcett was offered a place in the European Union Baroque Orchestra 2001, which launched her career as a period instrument specialist. Since then she has performed throughout Europe and further afield with groups including the English Concert, The King’s Consort, Ex Cathedra, the Academy of Ancient Music, Florilegium and the Amsterdam Baroque Orchestra. Kate is a founding member of the Musical and Amicable Society and of the pan-European chamber ensemble Bizzaries. She was the founder and Artistic Director of Early Music at the University of Leicester 2004-7 and maintains an active interest in arts administration, particularly within the early music field. Kate also continues to perform as a modern player, with string quartets and chamber orchestras including Worcester Chamber Orchestra and Sinfonia ViVA.